"Goldie" came to us aged 8 1/2 years. 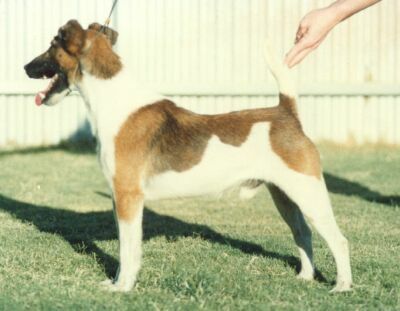 At age 9 he took the award of Best in Show at the annual Fox Terrier Specialty. He is the sire and grandsire of numerous champions both in Australia and Overseas. Goldie excelled in head qualities, reach of neck and lay of shoulder. These qualities are still evident in his descendants today. Known Progeny: Ch Blackfox Gold Label, Ch Blackfox Golden Rose, Ch Jentagamar Spy Catcher, Am Ch Kenilglen Gold Piece BISS (SD ROM) who sired 20 champions.